Nissan has unveiled the all-new high-performance Juke Nismo at the 2013 Tokyo Auto Salon, and is ready for buyer orders starting February 1, 2013. The highly-anticipated Nissan Juke Nismo is the beginning point for the Nissan brand as they begin to roll out new performance-oriented vehicles. Nissan says this new Juke Nismo production model represents the first model in Nismo’s new brand strategy. Nismo who is the high-performance brand of Nissan, designed and built the new Juke Nismo. Nissan along with Nismo will be focusing on creating more premium high-performance sports vehicles in the future. As with other premium performance brands, the car is directly inspired from the arena of motorsport. The Juke Nismo is powered by a direct-injection turbocharged 1.6-liter performance DIG-T engine which produces 197 horsepower. The engine was directly inspired by the one used in the DeltaWing Le Mans race car. The aerodynamic body kit and custom exterior styling came from aerodynamic technology honed through Nismo's participation in the Super GT Series. The performance Juke Nismo’s body kit is designed to reduce lift at high speeds with a 37 percent increase in downforce compared to the stock model, dramatically improving the vehicle's overall stability. A special torque vectoring system will also be offered, helping to improve grip and cornering ability. The front bumper has been redesigned along with the spoiler both resulting in less drag and increased downforce. The performance Juke Nismo features a stiffer sport suspension that gives improved handling through the corners and greater stability at high speeds. It was developed in Europe on the faster and more irregular roads and displays a quicker steering response. The new Juke Nismo will ride on 18-inch Nismo alloy wheels and wider 225/45R tires to provide extra traction and grip on the pavement. Inside, the Nismo treatment continues with a special sport steering wheel, pedals, gauges and other interior trim. The sporty Juke Nismo will also come with sport seats with red stitching and extra bolstering for spirited driving through the corners. Look for Nissan and their performance division Nismo to bring more radical models to production in the future. Andy Palmer, Executive Vice President Global Product Planning, says "The introduction of Juke Nismo further cements our dedication to provide innovation and excitement for everyone. The Juke, with its radical design and pioneering attitude, is the natural choice to be one of the first Nissan models to receive the mythical performance and distinctive design treatment from our Nismo specialists." 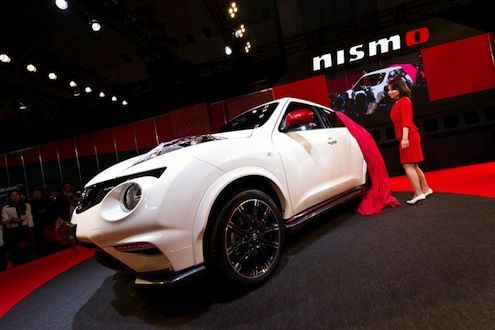 Nissan will be taking orders for the new Juke Nismo from February 1, 2013; nationwide sales in Japan begin February 19. The U.S. launch of the Nismo will be sometime after the European model hits showrooms. This story on Nissan Juke Nismo is updated on May 18, 2018.